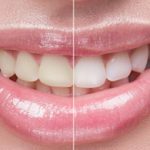 You should be well aware of the fact that the discolored teeth is a kind of serious dental problem and so, it is required to visit the dentist in case of discolored teeth. Depending on a variety of factors such as environment, genetics, poor hygiene as well as trauma, these discolored teeth can generally happen to anyone. We all go through that particular stage of our life where we are questioned by someone on the color of our teeth. So, it is very much important to take a much closer look at this particular topic. Sometimes, the tooth discoloration can preferably be normal and so, it is not considered to be harmful. You should also remember the particular fact that no one is born with a pearly white as well as perfect teeth. This discoloration can either show as yellow tinge, white streaks or brown spots. There are usually a few different types of the discoloration of which one is known as extrinsic. Extrinsic means that the enamel or outer tooth layer usually becomes stained. There are certain drinks or foods which are responsible for this such as wine, coffee, certain fruits, tea or vegetables, poor oral hygiene as well as smoking. On the other hand, the second type is preferably known as intrinsic which occurs when the internal structure of the tooth known as dentin possess a yellow tinge or become darker. Discoloration is such a thing which can also be affected by age. Over the years, your enamel usually becomes thinner and also become yellows over time. When you preferably visit the dentist for discoloration then there are no such tests which are preferably needed in order to properly diagnose it. To understand the discoloration of your teeth, the dentist just needs to look at those yellow teeth. Regular scales or cleans preferably help in the reduction of the stains wherever it may be either tea or coffee stains. An in-chair Teeth Whitening Treatment can also be considered to be a very good option for you. This occurs at the time when there is a careful application of the hydrogen peroxide gel to your teeth specifically by your dentist. It helps to give your teeth a blue LED light shine. As a result, this particular process can contribute to whitening your teeth up to about8 shades lighter. It is good to question what can we preferably do at your home in order to reduce the yellow stains present in your teeth. You are required to maintain good oral hygiene i.e. you should preferably brush your teeth twice a day for about 2 minutes each time. Also, you should not forget to floss in between. Tartar, as well as plaque, can generally build up on your tooth which can make your tooth to look yellow. You should preferably try to rinse your mouth out with water at the time when you are drinking anything which is renowned for staining teeth like wine or coffee. Along with that, you can also preferably use whitening toothpaste which contributes to the effective removal of very minor stains and also it could be bought over the counter. Hurry; book your appointment today for obtaining the best dental services in Melbourne.